General Hospital (GH) spoilers has some great news to pass on about a popular GH star. Maura West, who portrays Ava Jerome on the ABC soap, is celebrating a romantic milestone. She and her husband are celebrating their 19-year wedding anniversary! 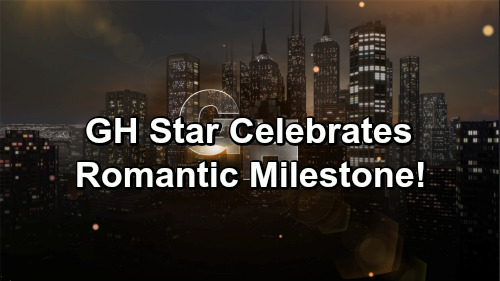 On General Hospital, Ava’s family and romantic relationships have generally been a mess. Most recently, her relationship with Griffin Munroe (Matt Cohen) fell apart and Griffin started dating Ava’s daughter, Kiki Jerome (Hayley Erin). Kiki was later killed by serial killer Ryan Chamberlain (Jon Lindstrom). But in real life, Maura enjoys a close relationship with her husband and kids. Maura is married to Scott DeFreitas, whom she met on the set of As The World Turns and married on January 22, 2000. Maura portrayed Carly Tenney on As The World Turns from 1995-1996 and from 1997-2010, and Scott portrayed Andy Dixon from 1985-1998. The couple has four children together: Joseph, Katherine, Basil, and Birdie. Maura also has a son, Benjamin, from her first marriage. Maura frequently posts photos and updates about what her kids are doing on social media and by all accounts is a proud mom. Maura has been portraying Ava Jerome on General Hospital since 2013, and she won a Daytime Emmy Award for the role in 2015. It was not her first Emmy win, however. She previously won the award twice for her portrayal of Carly Tenney on As The World Turns. Our congratulations go out to Maura and Scott on their anniversary! Stay tuned to the ABC soap and don’t forget to check CDL often for the latest General Hospital spoilers, updates, and news.